Impact Downtown Albany is the action-oriented strategy tapping Downtown’s power to drive community and economic growth in the City of Albany and the Capital Region. This market-driven strategic plan recognizes and positions Downtown, its adjacent warehouse district and riverfront as the ideal 21st Century urban center—a strong economic hub, a vibrant neighborhood and a modern, dynamic destination. Click the links below to read and review this game-changing strategy. During its 62nd Annual Conference and Tradeshow in Atlanta on Sept. 8, 2016 the International Downtown Association recognized Capitalize Albany Corporation and the Impact Downtown Albany strategic plan, awarding the Downtown Achievement Award of Excellence. Read more. Do you want to learn more about the current IMPACT? Click here to read implementation updates. Follow us on Twitter @CapAlbanyCorp or Facebook.com/capitalizealbany and read about updates using #ImpactDowntown. 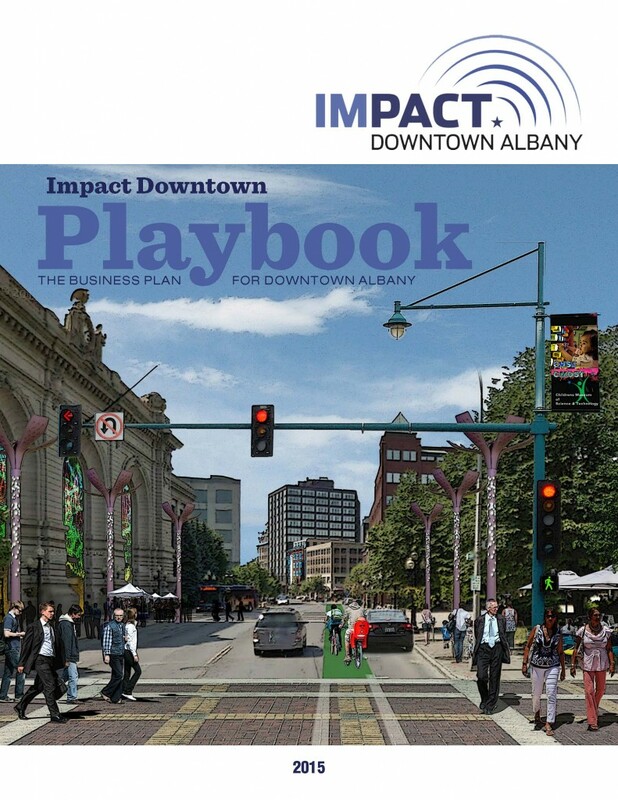 Below you will find links to multiple studies conducted during the development of the overall Impact Downtown Albany strategy and Playbook that serve as supplemental materials. Impact Downtown Albany embraces public/private collaboration as a proven model for unlocking the potential of great places. More than three dozen key stakeholders—including private corporations, non-profit entities, academic institutions and public entities—have come together to champion the revitalization of Downtown Albany, putting the “pact” in “Impact.” These partners have invested significant time, funding and ideas in the strategic plan, and are poised to produce impressive results through ongoing implementation partnerships. Click below to learn more.